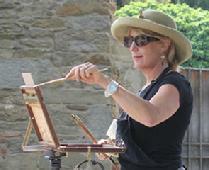 Paint with Laurie & Shannon in Tuscany and Umbria! This workshop is designed for the student who would like to take their work to a higher level of mastery � particularly in the area of the colors of light and shadow. The workshop combines a bit of color science, a bit of color history, and a lot of color painting! We will study the colors that the sun emits during different times of day and how these wash over and influence all the colors on your palette. We will understand how light also effects the colors of shadows. Additionally, we will study and apply this knowledge to the mixtures of gorgeous, glowing neutrals. Do you know the difference between a cadmium and a quinochridone pigment? When would you select a Hansa Yellow over a Cadmium Yellow? You will leave the workshop armed with information in the science behind your pigments and why the differences are important to your work. When and how should you underpaint? We will explore and practice several options to help your paintings glow. You will also learn how to create depth in a painting, paint beautiful atmosphere, and design a strong composition with color. This workshop is incredibly fun and entertaining and packed with information. I teach with humor and love so that you will feel most open and free to express yourself! **Included with "Hotel Italia" plans only. See details. *All-inclusive plans are Hotel Italia plans only. ...$2999.00 per person single occ! Non-Participating guests are included on the opening reception at La Saletta and on the day trips to Florence and Siena. Non-Participating guests who have chosen an �all-inclusive� plan or the Group Meal Plan (GMP)are also included in the wine tastings and meals. With advance notice and based upon availability other excursions and tours may also be arranged at additional cost. Available may be wine tours, golf, hiking, horseback or trails rides, bicycle rental, scooter rental. Day trips by train, bus or taxi are possible to Arezzo, Orvieto, Assisi, Florence, Montepulciano, Perugia, Piensa, Montalcino Siena and Lake Trasimeno. Thursday is market day in Camucia, below Cortona. Val di Chiana Outlet Village is also open daily. -Day trip to Assisi to paint or visit with lunch provided. Laurie Meyer has lived and painted in Charleston, SC for over twenty years. Following careers in education and corporate sales, Laurie devoted her life to her first love � painting � in 1997. She is largely self-taught and has studied with esteemed artists and teachers throughout the United States. Life in Charleston has provided Laurie with countless subjects and rich inspiration for her award winning watercolor and oil paintings. Her frequent travels have also given Laurie varied and interesting ideas for many of her works. She paints with rich color and broad �brushy� strokes and palette knife to express the unique and recognizable softness in her work. Most recently, Laurie was awarded First Place in the Piccolo Spoleto Outdoor Art Exhibition. Art has also played a role in community involvement for Laurie. She is the past president of the Mt. Pleasant Artists Guild, serving two terms. Laurie also served eight years on the Board of Directors of the Alzheimer�s Association and originated the Art of Alzheimer�s exhibit, now under the auspices of the Charleston Artist Guild. Laurie is past Program Director for the Charleston Artist Guild and past Director of Artistic Growth. Laurie is also a member of the Oil Painters of America, Charleston Outdoor Painters Association, the SC Watercolor Association, the Portrait Society of America, and American Impressionist Association. 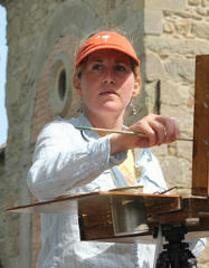 Laurie teaches private lessons in her studio as well as lively and popular workshops in wonderful locations throughout the U.S., San Miguel, and upcoming in Cortona, Italy. Laurie Meyer is represented by the Wells Gallery in Charleston and on Kiawah Island, The City Art Gallery, NC, and I. Pinckney-Simons Gallery. She resides on Daniel Island, SC with her creative and supportive husband, her incredibly devoted labradoodle - happily empty nesting while their three daughters embrace adulthood. Charleston native Shannon Smith has quickly ventured beyond the title of up-and-coming artist and has established a solid reputation within the fine art community. Regardless of what subject she chooses to paint, Smith has proven to possess an unusually keen eye and an unrivaled sensitivity to light. It is her attention to detail coupled with the use of strong, warm and cool colors that she uses to delicately capture the fading light of the late afternoon hours.In many of her canvases, Shannon Smith paints strong contrasts of color, with dramatic darks and subdued grey tones juxtaposed with warmer, more radiant hues. But, as always, her main focus is capturing light. Born and raised in the Lowcountry, many of her works are inspired by the beauty of coastal landscapes and downtown Charleston scenes. However, Smith has painted in Europe and studied with nationally known artists such as Kim English and Gregg Kreutz. �I�m inspired by the drama of light interacting with the subject or a mood created by a scene, telling us stories.�For Smith, art has always been a natural part of life. She was raised in a household of artists. Her mother is noted oil painter Betty Anglin Smith, and her siblings Jennifer Smith Rogers and Tripp Smith are also accomplished artists. It was this constant immersion in art that helped foster 38-year-old Smith�s talent from an early age. After completing her BFA at Clemson University in 1994, Smith has been painting professionally. She has been honored by the Oil Painters of America and she is a signature member of the Plein Air Painters of the Southeast. In addition to showing in Charleston she is also represented in Atlanta, GA. Corporate collections include pieces in the Clemson University Foundation, Piggly Wiggly Corporate Headquarters, McCrady's restaurant, and Hospice of Charleston. You will need a tripod to hold the box. These are available on the box sites. Also, you will find on both sites several accessory options. An extender is nice to have to give you a little shelf to hold your stuff. You also might want to order a few brass hooks to hang your mineral spirits container. Paint - please order a professional grade oil such as Gamblin, Winsor-Newton, Holbein, etc. Please do NOT order Winton or Georgian. Obviously, the smaller tubes will weigh less and will be easier to handle. Brushes - if you have a good supply of quality hog bristle, bring a variety of sizes. If not, a brand such as Robert Simmons, Silver, Princeton, or Escoda are good choices. Please get size 2, 4, 6, 8, 10, 12. Also, please bring a medium sized soft brush made from mongoose or sable. This is a great view finder and can be found at any art supply store or on Open M Box. Also, please bring a little sketch book for thumb nail sketches and a notebook for notes! Oderless mineral spirits will be provided. Liquin and other solvents may be purchased in Cortona.